CakePoker.com is a USA friendly poker site that is only a few years old, but has already become one of the better online poker rooms. Highlights at Cake include the rewards program, big Sunday tournaments, and soft cash games. Cake Poker (www.CakePoker.com) arrived to the online poker scene in 2005, and has already established themselves as a top-flight poker room. Their acceptance of USA players has allowed them to quickly build a player base, and with thousands of players online at all times, you will always be able to find a game. Some of our favorite aspects of Cake Poker include their $600 sign up bonus, their Cake Rewards program, their enormous amount of monthly guaranteed tournaments, and their fishy competition at the lower stakes. Cake Poker has very clean, easy to navigate poker software. When you open up the lobby you are presented with a news screen displaying the latest promotions and tournament results for the day. From there, you have easy access to Ring Games or Tournaments, and can also access your Cashier or Rewards information. One unique feature of the Cake Poker lobby is that you have a small news feed in the bottom right corner of the window. It isn't obtrusive, but it allows you to see upcoming tournaments, as well as promotions that you can capitalize on. If you are ready to play a poker game, you'll click either Ring Games or Tournaments. If you choose Ring Game, you'll have a few filters available to narrow down what tables meet your needs. First, you can break it down based upon the game you wish to play: Texas Hold'em, Omaha, Omaha Hi-Lo, 7 Card Stud, or 7 Card Stud Hi-Lo. From there, you can choose Play Money or Real Money, as well as Fixed Limit, Pot Limit, or No Limit stakes. CakePoker also gives you the option to hide full tables so that you'll only see the tables that are available for your play. On the other hand, if you choose Tournaments, you are also presented with some filter buttons to help narrow down the vast number of tournaments that are offered. You can break it down by the variety of tournament (Scheduled, Satellite, Gold Card/Chip, Freeroll, Event, Private, or Sit and Go), the game being played (Texas Hold'em, Omaha, 7 Card Stud), and the limit (Fixed Limit, Pot Limit, No Limit). Similar to before, you can choose to hide running and completed tournaments so you will only see the ones that are available for your play. At this time, Cake Poker only offers one theme for the table. We hope that they update in the future and add customizable themes like Full Tilt Poker and PokerStars, but for the time being the current theme is acceptable. 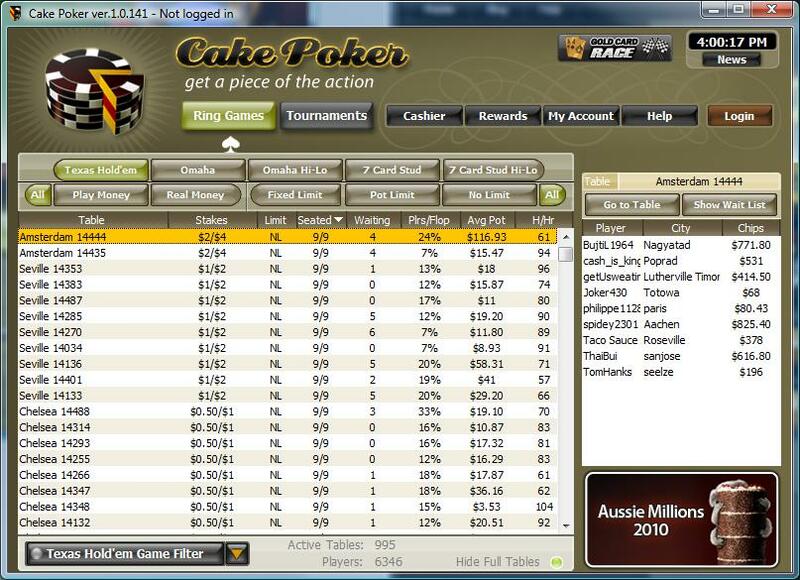 Learn how to download Cake Poker, and more about the software. When you make your initial deposit at the site, CakePoker.com will provide you with a 110% up to $600 match bonus. This bonus amount will be placed into your Pending Bonus account, and the balance of your bonus can be viewed in the Cashier at any time. To clear the bonus to your real money account, you have to earn sufficient FPP's (Frequent Player Points) to clear the entire amount. Each FPP is worth $0.06 towards your bonus, and the bonus is paid out in increments of $10. So, to clear one increment of $10 you'll have to earn 166.6 FPP's. FPP's are earned by playing for real money at the CakePoker.com poker room. If you are playing at a real money ring table, you will earn an FPP for every dollar raked during the hand. You only have to be dealt cards to earn FPP's, you don't have to enter the pot. Also, CakePoker pays out FPP's in fractions, so if the rake is $1.57, you will earn 1.57 FPP's. Besides just the initial deposit bonus Cake, also offers frequent reload bonuses for their players. These often come in the form of Weekend Reload Bonuses, and Cake will send you an email to notify you when you can take advantage of these offers. Keep your eyes peeled. CakePoker.com always has thousands of tables running, across multiple stakes and variations. The most common game for poker players is NL Hold'em, so we'll start there (Cake actually made our list of best poker sites for Texas Hold'em). At the moment there are tables running at the lowest limits ($0.02/$0.04) right up to the highest limits ($100/$200). In addition to just the normal 10-handed tables, Cake also runs plenty of 6-handed tables, as well as a few 2-handed tables for strictly heads up play. In Limit Hold'em, the stakes begin at $0.04/$0.08 and run all the way up to $100/$200. However, at the time of this writing the highest stakes game running is $30/$60. Just like in NLH, there are 10-handed, 6-handed, and heads up tables. 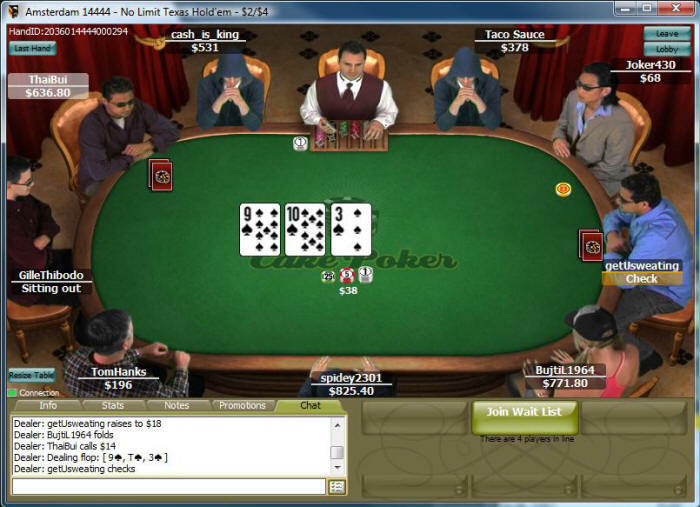 CakePoker also hosts Pot Limit Hold'em games, but at the moment there are no players at the tables. Omaha action is fairly limited, and at the moment there are only five active tables, ranging from $0.02/$0.04 to $2/$4. Omaha Hi-Lo is similar in the fact that only four tables have players right now. Also, when we tried to access 7 Card Stud or 7 Card Stud Hi-Lo games, no tables came up at all, so either the lobby was malfunctioning, or Cake doesn't really offer 7 Card Stud. Cake Poker also runs their mega tournaments on Sundays just like everyone else. The biggest weekly tournament they offer is their $100,000 Guaranteed on Sunday at 5:00 PM EST. This is a $162 buy-in, and since there are tons of satellites running all week this tournament usually eclipses the guarantee, making for a huge prize pool. Also, on the final Sunday of each month, Cake runs a $250,000 Guaranteed with a buy-in of $268. This tournament starts at 5:00 PM EST as well, and is the biggest tournament Cake runs regularly. Satellites to this tournament are available the last week of the month. CakePoker.com's tournament structure is decent; they have ten-minute levels for their regular tournaments, and six minute levels for their turbo tournaments, with breaks every hour. Cake Poker has a unique promotion with their Gold Cards idea. Gold cards are randomly dealt out at ring games, and each player attempts to accumulate a full deck. Whenever the rake reaches a certain amount, a Gold Card is displayed at the table, and if you hold that card in your hand (even if you've folded) you will receive the Gold Card. Cake Poker runs Gold Card Series every year which reward players for successfully collecting every Gold card in the deck. Series I, II, and III have already completed, awarding each winner $52,000. Gold Series 2010 is underway, so make sure to sign up at CakePoker.com now to get started. Besides just the jackpots, Gold Cards can also be used to buy-in to special tournaments and satellites. To locate these events, just click the Tournaments button, then the button that has Gold Cards and Chips on it. Gold Chips are Cake Poker's version of a player rewards program, and the Gold Chip program made our list of poker sites with best rewards programs. To accumulate Gold Chips you earn FPP's by playing for real money, then watch the Gold Chip Meter in your player account fill up. Once the meter is completely full you will earn the Gold Chips that was displayed, and the meter will empty so you can start over. Also, every time you earn a Gold Chip you will notice that the meter gets smaller and smaller, meaning that you can accumulate further Gold Chips in less and less time. Plus, if you earn five Gold Chips in one month, you receive a bonus Gold Chip for free. After your fifth Gold Chip you can continue accumulating chips all month long at the increased meter rate. As you accumulate Gold Chips, you have a number of options as to what you can use them for. Your first option is to use them in Cake's Weekly Gold Chip Giveaways. These are essentially freeroll tournaments that you buy in to using your Gold Chips. This weekend there is a $5,000 Gold Chip tournament that is only 5 Chips to buy in to. Also, the first weekend of every month Cake has a $15,000 freeroll that is a 20 Chip buy-in. The next option for your Gold Chips is to use them to accumulate more chips! Cake runs Sit and Go's as well as MTT's where you buy-in for chips, and the prizes are also chips. This is a great way to increase your number of chips, because the competition is usually very soft. Your final option for Gold Chips is to use them in the Cake Poker Rewards Store to redeem them for books, electronics, tournament buy-ins, and much more. Unfortunately, Cake Poker only offers email support. The support is 24/7/365, but we would like to see a phone number or live chat option in the future. The email support team is speedy and efficient, but they aren't instant. Visa, MasterCard, eWalletXpress, UseMyWallet, NETeller, Moneybookers, EcoCard, PaySafeCard. Paper Check, eWalletXpress, UseMyWallet, NETeller, Moneybookers, EcoCard, PaySafeCard. Thank you for reading our review of the CakePoker.com poker room. If everything sounds great, head over to www.CakePoker.com to sign up and start playing. If you still aren't sure, remember that Cake Poker accepts all American, Canadian, European, Latin American, and Central American players, and everyone is welcome to redeem the $550 sign up bonus. Also, if you plan on playing often you will be able to redeem reload bonuses every week. Our other favorite features at Cake Poker include their Gold Card and Gold Chip rewards system, their wide variety of deposit and withdrawal methods, and their soft player competition. If you play at Cake Poker, you should have no problem winning (especially with our poker strategy).